Saturday May 9th 1925 I rode to town with the folks in AM. Then back as soon as we ate dinner and waited at The Store for Hattie, Birdie & Cora. I took them to a picture show. They brought me home. Charles Bremner came again. 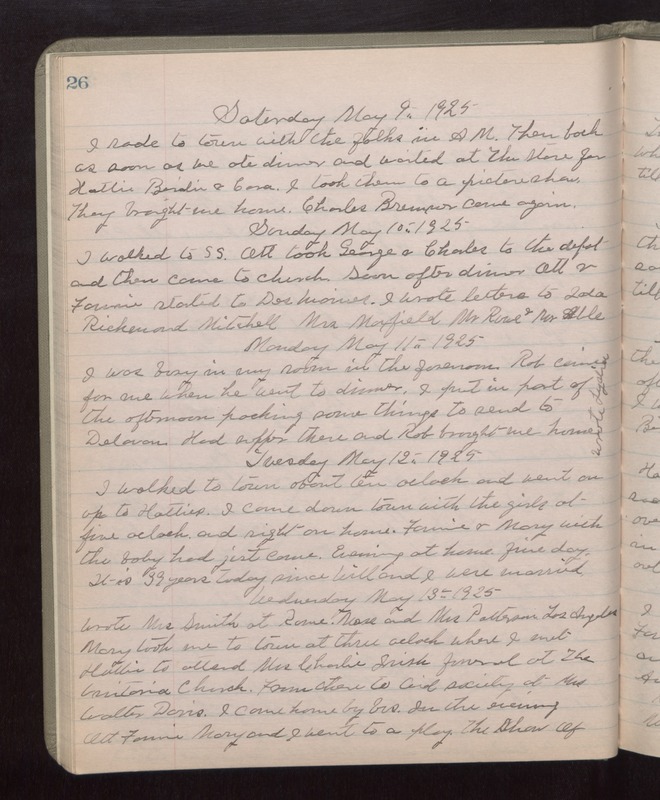 Sunday May 10th 1925 I walked to S S. Ott took George & Charles to the depot and then came to church. Soon after dinner Ott & Fannie started to Des Moines. I wrote letters to Ida, Richmond Mitchell, Mrs Maxfield, Mr Rowe & Mr Able. Monday May 11th 1925 I was busy in my room in the forenoon. Rob come for me when her went to dinner. I put in part of the afternoon packing some things to send to Delavan. Had supper there and Rob brought me home. Wrote Lydia. Tuesday May 12th 1925 I walked to town about ten oclock and went on up to Hatties. I came down town with the girls at five oclock and right on home. Fannie & Mary with the baby had just come. Evening at home. Fine day. It is 39 years today since Will & I were married. Wednesday May 13th 1925 Wrote Mrs Smith at Rome, Mose and Mrs Patterson Los Angeles. Mary took me to town at three oclock where I met Hattie to attend Mrs Charlie Irish funeral at The Unitarian Church. From there to Aid Society at Mrs Walter Davis. I came home by bus. In the evening Ott, Fannie, Mary and I went to a play "The Show of."